Location Redmire CP. Thorny Bank Hill and Grasper Bank Spring. Two burnt mounds at locations listed below. Record Description #1, Thorny Bank Hill	SE047 934 380m	Medium, low	Ring cairn, small cairns and field banks nearby (recorded seperately). #2, Cobscar Rake - Grasper Bank Spring	SE052 932 375m	Large, high	At spring rise. The site at Thorny Bank Hill is masked below heather above a recently excavated fire fighting water supply dam and is difficult to locate (Photograph to follow). 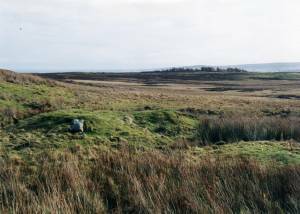 A well defined unenclosed round house or possible ring cairn is located on the western side of the rising ground southof the track at NGR to follow. Small cairns and indistinct field banks indicate the presence of an unenclosed settlements close to these burnt mounds. 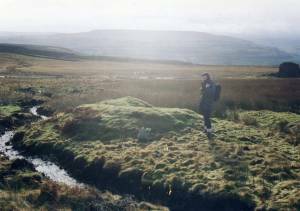 The site at Grasper Bank Spring is large and prominent, at spring rise below small lead mine adit. See photo. Small hut circle nearby. Image 1 Description Large burnt mound at Grasper Bank Spring head. Image 2 Description Large burnt mound at Grasper bank Spring.